We know that there’s a lot of information here, but we want you to be fully informed about your rights, and how the Kelly Group of companies uses your data – this notice covers your use of Kellys DIY website along with your marketing preferences for other companies in the Kelly Group. We hope the following sections will answer any questions you have but if not, please do get in touch with us. Kellys-diy.com understands that customers may have concerns about security on the internet. Our website uses third party providers to process payments (for example PaylPal) and for marketing – see third parties section below for full details. Kellys-diy.com operated by Point Building Supplies a trading division of Kelko Plant Sales Ltd (hereafter referred to as Kellys DIY) are committed to protecting your privacy in accordance with General Data Protection Regulations (commonly known as GDPR) and other applicable laws. Any personal information about individuals is collected by Kellys DIY and is only collected where it is specifically and knowingly provided, for example at the time of registration on our website or at the time of ordering (when we collect personal information to process and fulfil your order/s), entering a competition etc. We, may from time to time contact you with offers and information you may be interested in – if you wish to receive this information you must specifically consent to get it and you can withdraw your consent at any time. 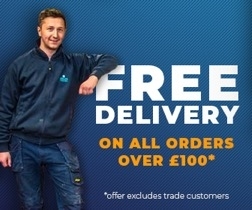 You can remove yourself from our mail list at any time by logging in to your account at www.kellys-diy.com/account/ and updating your newsletter preferences under 'Account Settings'. You can also follow a link to unsubscribe at any time if you receive an email from us about our product, services, offers, promotion days/evenings etc. You can also email or write to us at any time to change your preferences – full contact details below. We do not retain any information regarding your credit card or banking details. We have associated companies within our group namely Kellys Point Hire Ltd and Kellys Golf Centre that if you consent to it we will record your contact preferences to receive details of special offers, promotional days/evening, competitions, products and services. We will use third parties for example to deliver goods, process credit/debit card payments and manage our mailing list. These third parties will have access to personal information needed to perform their function but may not use it for other purposes. We may pass personal information to external agencies to protect against fraudulent transactions and to provide the services you have asked for. Kellys DIY will try to provide you with external links to high quality, reputable websites which we believe may be of interest to our customers. Such third-party sites are not under our control and we therefore do not accept any responsibility for or liability in respect of your privacy and or experience on these websites. What is the Kelly Group? For simplicity throughout this notice, ‘we’ and ‘us’ means some or all of the above businesses in the context of marketing preferences – information will not be shared for anything other than the marketing preference you have chosen. When you visit Kellys DIY and use your account to buy products and services or redeem vouchers online. When you ask for us to email you information about a product or service. When you’ve given a third-party permission to share with us the information they hold about you for example when you use PayPal. When you use our car park and shop which has a CCTV system in operation which records your image for the security of both customers and staff. The type of information we collect for the above for example could include your name, date of birth, address, contact details, your areas of interest and marketing preferences etc. If you have a web account with us: your name, billing/delivery address, orders and receipts, email and telephone number. For your security, we’ll also keep a record of your login password. For the purpose of direct marketing we ask for and use your personal data for recommending items you have said are of interest to you. Of course, it’s always your choice whether you share such details with us and if you have opted in you can opt out at any time. Your image may be recorded on CCTV when you visit the shop or car park. If you interact with us through social media we will see your username and use it to help us respond to your comments, questions or feedback. In order to provide you with the best possible customer experience we use your information to offer you promotions, products and services that are most likely to interest you if you have consented. If we don’t collect your personal data during checkout, we won’t be able to process your order and comply with our legal obligations and contractual necessity. To protect our business and your account from fraud and other illegal activities. This includes using your personal data to maintain, update and safeguard your account. We may also monitor your browsing activity with us to quickly identify and resolve any problems and protect the integrity of our websites. We’ll do all of this as part of our legitimate interest. To protect our customers, premises and assets from crime, we operate CCTV systems in our store and car park which record images for security. If we discover any criminal activity or alleged criminal activity through our use of CCTV, fraud monitoring and suspicious transaction monitoring, we will process this data for the purposes of preventing or detecting unlawful acts. We aim to protect the individuals we interact with from criminal activities. We do this on the basis of our legitimate business interests. With your consent, we will use your personal data, preferences and details of your transactions to keep you informed by email, web, text, telephone about relevant products and services including invitations to events, special offers, discounts, promotions, events, competitions and so on. You are free to opt out of hearing from us by any of these channels at any time – you can contact our head office premises directly by email on privacy@kellys-group.com or log in to your online account or click the unsubscribe link in any email you receive from us or by writing to us for full details of our address see below –we will do our utmost to update your opt out preference as quickly as possible but that this may take up to two weeks. To display the most interesting content to you on our website we may use data we hold about your favourite products. We do so on the basis of your consent to place cookies or similar technology on your device when you are navigating our website. To process your order, we will need to share your details with third parties providing a service such as delivery couriers, payment processors and fraud prevention services. We do so to provide the service you have requested. Without sharing your personal data, we’d be unable to fulfil your request. Access to your personal data is password-protected, and sensitive data such as payment card information is not held by us but it with secured payment processors such as PayPal or Realex. Our systems our regularly monitored for possible vulnerabilities and attacks to identify ways to further strengthen security. Whenever we collect or process your personal data, we’ll only keep it for as long as is necessary for the purpose for which it was collected. The period for which we keep personal information is determined by a number of criteria including the purpose for which we are using the information, the amount of sensitivity of the information, the potential risk from any unauthorised use or disclosure of the information, and our legal and regulatory obligations. For full details of our cookies policy please click this link. For example, when you withdraw consent and we have no legitimate overriding interest to keep your information. You have the right to request a copy of any information about you that we hold at any time, and also to have that information corrected if it is inaccurate. To ask for your information, please contact the Data Protection Officer by the method you choose – contact options below. Click the ‘unsubscribe’ link in any email communication that we send you. We will then stop any further emails from the particular divisions you select, or all divisions if you so choose. If you have an account, log into your account, visit the ‘Account Settings’ area and click the unsubscribe link. Write to Data Protection Officer, Kellys, Milltown East Industrial Estate, Upper Dromore Road, Warrenpoint, BT34 3PN. You can write to Data Protection Officer, Kellys, Milltown East Industrial Estate, Upper Dromore Road, Warrenpoint, BT34 3PN. We may review and update this Privacy Notice when the need arises – the latest version will be published on our website, printed copies can be requested from our head office at the address above if your require, updates may in certain circumstances be emailed and or posted to you.